The card reveals for Hearthstone's Kobolds & Catacombs expansion are underway, so Shacknews takes a look at more card reveals from over the Thanksgiving holiday weekend. Analysis: Rummaging Kobold introduces an under-the-radar new mechanic to Hearthstone. Prior to this card's introduction, weapons that are destroyed or used up go away forever. But this minion can bring the weapon right back to your hand. Pirate Warrior and Rogue immediately come to mind, but I don't particularly see them utilizing this minion's weak 1/3 stat line. But let's not assume this is entirely useless. This may not end up panning out, but I'm wondering if this can find a good home in a Shaman deck. This might actually work quite nicely in an early-game Shaman deck that packs Jade Claws. It can help pour the pressure on in the early turns, while summoning slightly larger Jade Golems. And in the later game, Evolve can buff this and the Jade Golem up into something a little more useful. It might even make a good companion to a Turn 4 Master of Evolution. 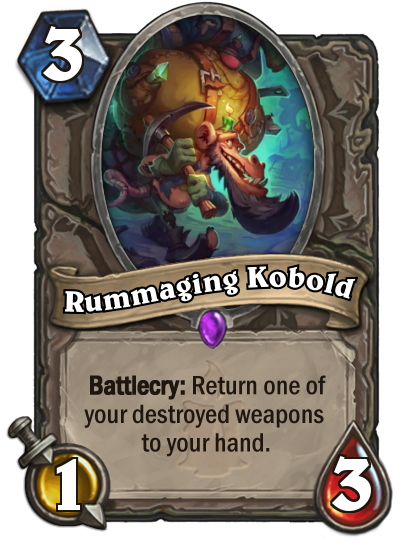 Rummaging Kobold isn't top tier by any means, but he'll have his uses. Analysis: There's something cheesy about this card. Cosmetic effect aside, Zola isn't the first card to feature this kind of copying ability. It's a little better than the Priest's Mirage Caller in the sense that it offers a straight-up copy of anything. It's handier than Shadowcaster, just for Zola's lower cost and its ability to copy the full minion. 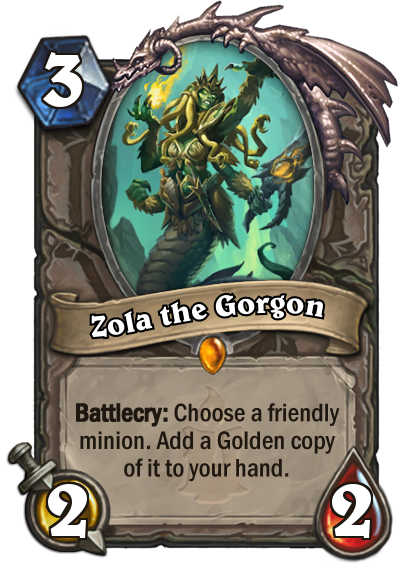 And it's better than Manic Soulcaster, in that it puts the copy in your hand and not your deck, though Zola's 2/2 stats aren't as great. Zola's best use will be in the early game in Prince Keleseth decks. In fact, Rogue can Shadowstep the Prince on Turn 2 and hold onto it before playing the fresh Prince alongside Zola to get some insane minion buffs. Zola's going to be one to keep an eye on, because there's likely an application that I'm not seeing beyond the Keleseth and Mill decks. There's going to be potential for something crazy broken here and I'm excited to see what that is within the first few weeks of the expansion. Analysis: Druid players are going to love Spiteful Summoner. 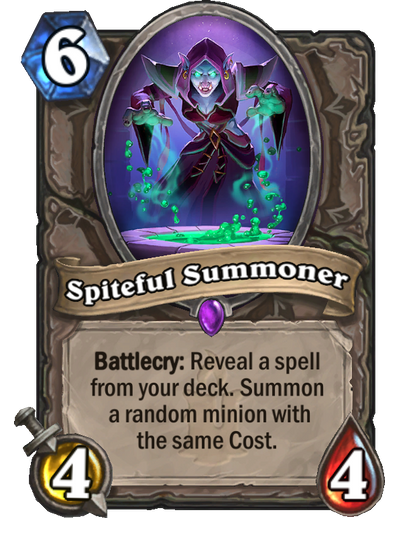 At worst, it's a slightly weaker version of Faceless Summoner, pulling out Jade Idol or Jade Blossom. That's not a great scenario, but it's not the end of the world. But at best, if this thing reveals an Ultimate Infestation, you're looking at a potential Deathwing on Turn 6. That's bonkers! If you're a Jade Druid player, it might even be worth keeping Jade Idols in-hand to make this scenario likelier. This has the potential to be a disgustingly good card in the right hands. Analysis: Blizzard continues to make the case for Deathrattle Hunter, even as N'Zoth, the Corruptor enters his final days in the Hearthstone Standard. 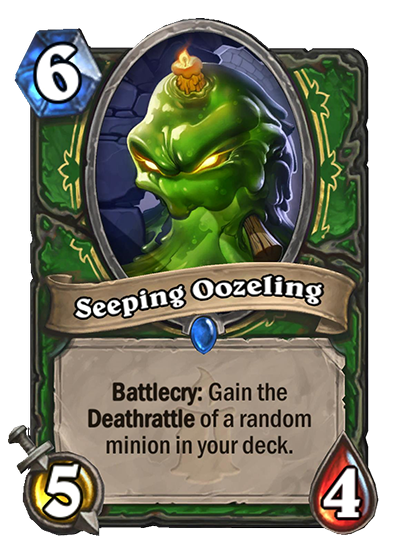 Seeping Oozeling's problem is that his stats don't justify his cost. A 6-cost is just too expensive for these weak stats and a random Deathrattle. Sure, you can get a Savannah Highmane Deathrattle for 6 mana. You know what you can also do? You can play Savannah Highmane... for 6 mana. Seeping Oozling has a few possibilities. He can act as a Arfus, help clear the board with the Exploding Bloatbat effect, and even surprise opponents with some straight-up shenanigans if it gets the Deathwing, Dragonlord effect. But the random effect doesn't make it a reliable play and its weak stats don't make it worth the gamble. Battlecry If you control no other minions, gain Taunt and Divine Shield. 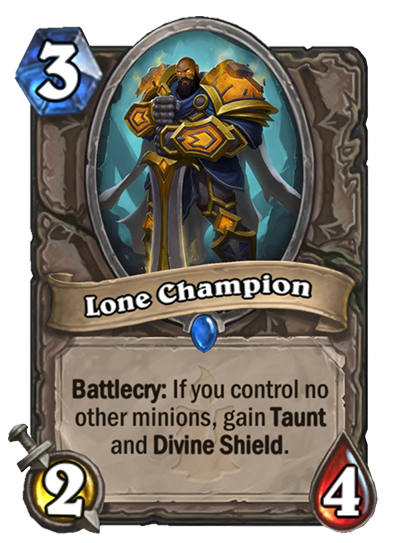 Analysis: Lone Champion is fascinating in that it's an anti-zoo card. It's specifically designed to work when there are no other minions on your side of the board, which isn't always a likely scenario in constructed. There are situations where that'll happen, but nobody actually plans for things to unfold that way. Control Paladin might, but I don't expect to see this too much from those decks. He's an interesting choice in Arena, because it's a cool effect if the conditions are right. And at worst, he's a vanilla 2/4. I don't expect to see Lone Champion get much action, but he's a half-decent Arena selection. Deathrattle: Recruit an 8-Cost minion. Analysis: I look at Silver Vanguard and think Skelemancer. It's an expensive minion with horrific stats for its cost, but with a Deathrattle that can bring something big onto the board. 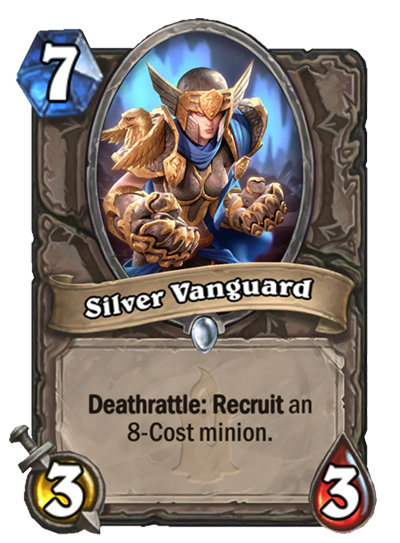 In Silver Vanguard's case, it's a minion that costs exactly 8 mana. That isn't exactly common these days since Ragnaros the Firelord went off to wreck insects in Wild. That makes me think there are some high-impact 8-mana minions coming soon. But truth be told, I like Skelemancer a lot more than this card, in terms of its function. Yes, Silver Vanguard's effect is a lot more likely to hit, but there are ways to make Skelemancer enough of a threat that the opponent just has to eat it and take it out, which will bring out that awesome 8/8 skeleton. Plus, Silver Vanguard's 7-mana cost is just too hard to stomach. 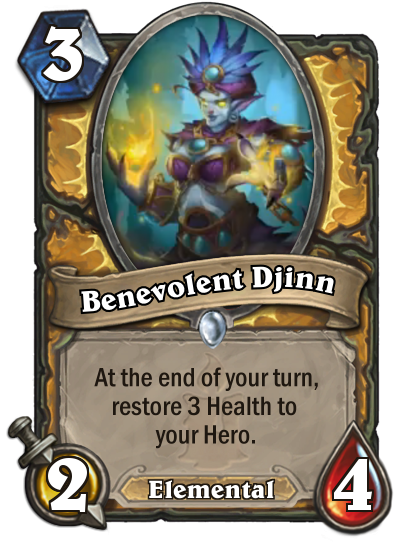 Paladin might give this a chance, just because it can bring out Tirion Fordring, Ragnaros, Lightlord, and The Lich King. But that mana cost is hard to swallow. Battlecry: Reveal a spell in each deck. If yours costs more, draw it. Analysis: It's the revenge of the Grand Tournament! This is the first time the jousting mechanic has been seen since that expansion released two years ago. Sadly, it's on a minion that doesn't make much use of it. Let's start with the obvious. With 2/2 stats and an effect that won't always hit, there's no reason to play this over Arcanologist. Arcanologist will always pull out a reliably powerful secret and can stand up to most early-game minions. Raven Familiar cannot. On top of that, the Mage packs a lot of useful cheap spells. Think of something like Frostbolt or Primordial Glyph. Those 2-cost spells won't win a jousting matchup against most other classes, aside from the Rogue. 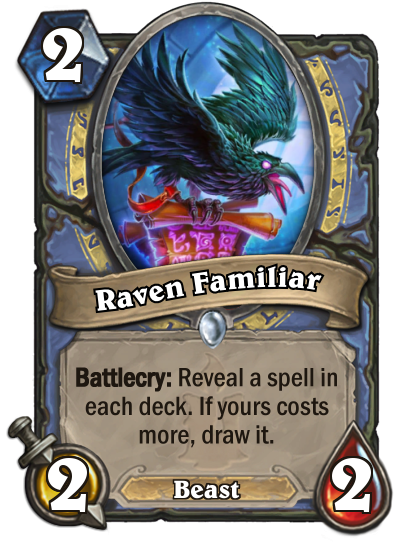 So at that point, Raven Familiar's a vanilla 2/2 and not worth the play. This bird goes back to the nest. Analysis: Whether this new Shaman Legendary is any good is a matter of perspective and depends on the situation. It's a tough sell when facing down a board full of minions. It's a no-go if there's a Keleseth Warlock or Keleseth Rogue and they're piling on the board presence. If that's not the case, this can be a lot of fun in both an Elemental Shaman and an Evolve Shaman deck. For the former, piling on with Blazecaller, Servant of Kalimos, and Kalimos, Primal Lord could be a big help as things start getting hairy in the late stages of a game. Evolve Shaman could pull a particularly strong draw off of Evolve or Thrall, Deathseer and potentially want some of those Battlecries. 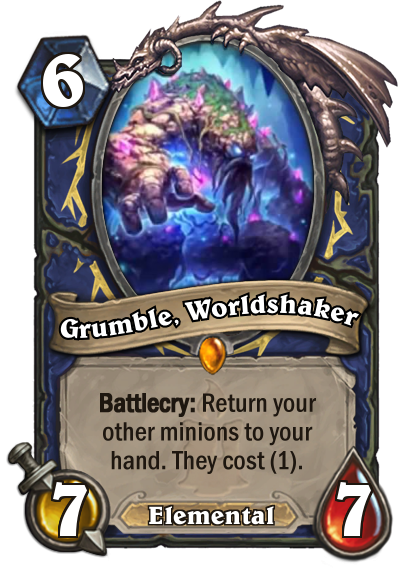 So play Grumble and make those Battlecries happen! Even Jade Shaman might find some good synergies here, pumping out even bigger Jade Druids by getting those Aya Blackpaw and Jade Chieftain Battlecries back for a second round. This is on the stronger side of the Shaman legendaries, assuming everything pans out. It's a big if, though, so make sure to keep that board as clear as possible. Analysis: A strong anti-aggro card for Paladin players and should be a staple in most control decks. This is basically Illuminator, but without the Secret trigger. It has the potential to be a great card for Paladin and its Elemental synergy is icing on the cake. This should also be a decent card to play later in the game with Blackguard, even if 3 damage isn't necessarily a massive hit in the late turns. Analysis: We conclude today's analyses with potentially the most broken card of the expansion. Here's the thing to know about Temporus. Throw away any notions of synergies or strategies or anything else. 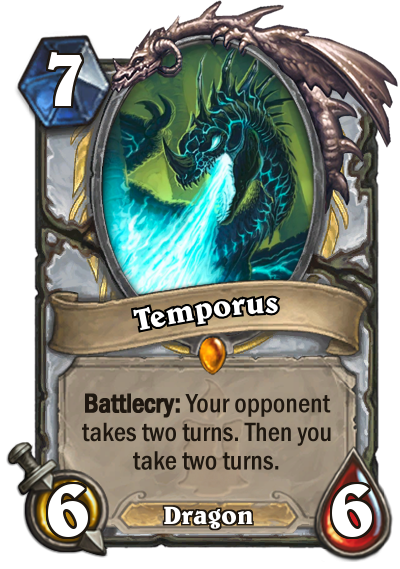 If a Priest plays Temporus, there is a very good chance that the Priest is ready to finish the game in his next two turns. There's a good chance he has Prophet Velen and Mind Blast ready to go and is about to wreck your face. Or he could have multiple health-boosting spells to go with Divine Spirit and Inner Fire. Either way, Temporus is essentially an "end of game" warning. The drawback for the Priest player is that the opponent gets to take their two turns first. If you're that opponent, you have to make those two turns count. Fortunately, that is entirely possible. Mage players will have ample time to respond with Archmage Antonidas, Rogue and Paladin players can toss out a Leeroy Jenkins Hail Mary, and Warriors and Druids can armor up to absurd levels. There are ways to kill the Priest before he kills you. But the one thing to remember is that no matter what, if Temporus hits the board, the game is most likely about to end. One way or another.